So the tour continues and already we’ve been to some remarkable places like Belfast where the theatre was beautiful and the audiences were amazing, to Southampton where I lived on a boat for a week, but this week is by far the most special as it’s my very own homecoming. Cambridge is my hometown and for the week I’m moving back in with my family. I should probably mention that I’m bringing Freddie, Anthony and Dylan to stay too. Coming back to Cambridge has been a most peculiar feeling, filled with nostalgia and excitement. It’s been very odd seeing my life on the road with the boys merge with my family life, but it’s been heart-warming too. I’ve made some great, hopefully life-long friends on the tour. I’ve tried to slip back into as normal a life as possible whilst staying with my family and they’ve been amazing, making me and my friends very comfortable. It’s nice to have good, home cooked food again, and they make sure we’re never hungry. It’s been great catching up with old friends and my family. I feel very loved here and it’s going to be a hard city to move on from. It will be like moving out all over again. It’s been a real honour performing in my hometown. The theatre we’re performing in is very different to all other venues on the tour. For one the stage at the Corn Exchange is intimate in comparison to others and the set seems to explode out into the front row making the action seem all the more closer and therefore real. At the same time though, that’s what makes the venue special. 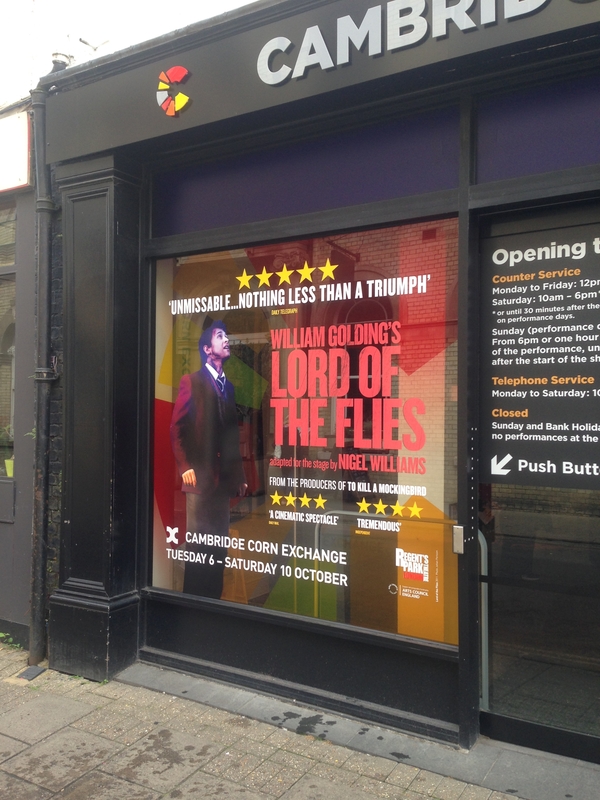 It’s a different viewing experience to that of your traditional proscenium arch venues and so far we’ve had large audiences, so I assume that the novelty of a production like this at the Corn Exchange has been attracting a huge interest. This has certainly been the most relaxed I’ve been all tour and for that reason I guess you could say Cambridge has been my favourite destination so far. The time I’ve got to spend with my friends and more importantly my family has been invaluable and it’s really charged up my battery’s ready for the next leg of the journey.